Magic Jump Rentals has provided party rental service in the Los Angeles county and surrounding areas since 1996. 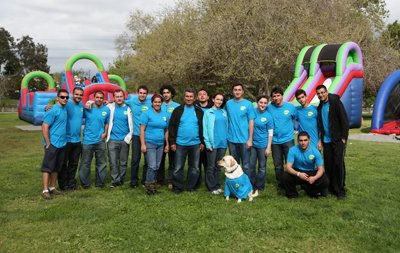 We have grown to be one of the biggest and most reliable inflatable rentals company in the Southern California area. MJR offers a large variety of jumpers, bouncers, combos, water slides, obstacle courses, slides, interactive inflatables, mechanical rides, rock walls, zip lines, euro bungees, photo booths, movie screens, carnival games, concession machines, and more! We continually look to add new and innovative inflatable units to our rentals. All of our inflatable units are fairly new and cleaned after every use. All of Magic Jump Rentals inflatable units meet the latest standards for safety in design and operation. We Deliver Fun, high quality, safe and clean party games and supplies with informative, fast and convenient help for all events and occasions. Honesty - We believe honesty is the key to any relationship, therefore, we are honest about our work and anything we do. Hard Work - All of our staff and employees are hard-working individuals who arrive before the sun rises and go above and beyond during weekends, holidays and late night events. Dedication - We are dedicated to providing the best service with the best products. That means we will work hard and go the extra mile to keep our customers happy. Safety - We believe safety is first and foremost and take pride in our educational and training procedures for our staff as well as our customers. We invite you to stay connected with us for the latest information about promotions, discounts, new products, party planning tips, and more!